Ankh-Morpork’s primary communication system has become inefficient and is losing money, so Lord Vetinari decides to reopen the Post Office. The 33rd book in Terry Pratchett Discworld series, Going Postal introduces a new ‘main’ character Moist von Lipwig who would have rather not be involved but once he was couldn’t get enough of his new profession. Moist begins his first book by dying—or rather one of his con-artist aliases does—and is given a job offer by Lord Vetinari to run the Ankh-Morpork’s long defunct Post Office. Moist accepts then runs away only to be recaptured by his parole officer, a golem named Mr. Pump, who joins him as part of the Post Office staff with a long time employee and a young pin collector who has “issues” who live in the Post Office building amongst the millions of undelivered letters pile around the building. As Moist figures out how to slowly begin operating the Post Office, he finds himself at odds with the Chairman of the Grand Trunk Company who Moist recognizes as a conman in his own right. Through the staffing of volunteer pensioners and the hiring of other golems, Moist starts getting the mail moving and becomes a target on a hit list but avoids death. Now in a fierce competition, Moist outduels his opponents and as Vetinari’s masterplan to solve the continuing breakdown of the Clack system which the city and many other’s rely on. While the overall plot and many of the characters are entertaining, there was something missing when it came to the satire and overall humor of the book. 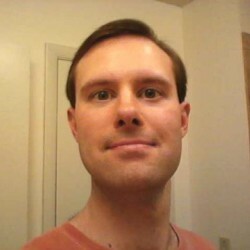 While “deregulation” of the economy and “finance” seemed to be a part of it, there was possibly an undertone of against a particular philosophy as well. Yet even without a seemingly overarching satirical theme the book wouldn’t have felt different if Pratchett hadn’t attempted to through in so much early 21st century parallels or shadowed references in addition to everything else going on. The humor and satire were there, but it just didn’t seem really laugh-out-loud funny with a few exceptions. 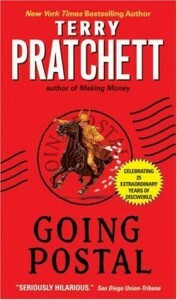 While Going Postal is not only of Pratchett’s best work, it is still an entertaining installment in the Discworld series that finds one looking forward to seeing what Lord Vetinari might have up his sleeve for his government employed con artist.